Take in the stunning ocean views from this Outer Banks vacation home. 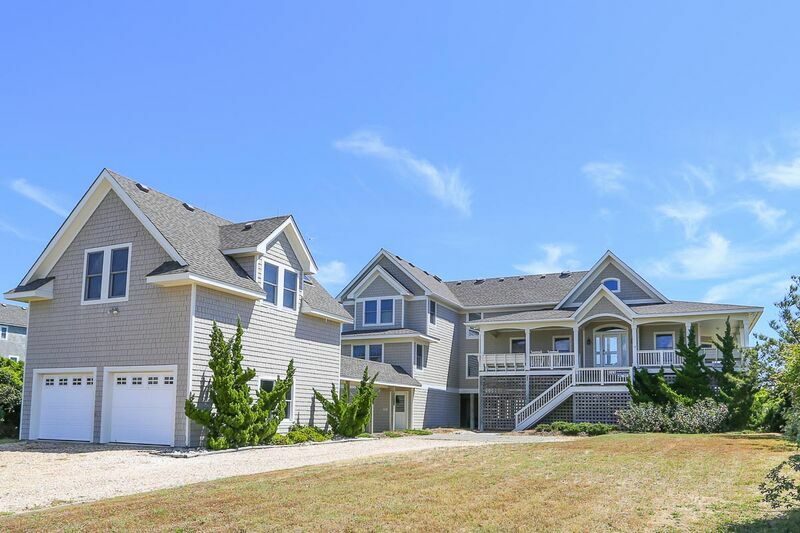 Russell is a 4 bed, 4 ½ bath home in the semi-traditional Nags Head style with wraparound porches. This beautiful home has traditional furnishings and an open floor plan. Enjoy the ocean from the living space and decks, take a swim in the pool, or walk down the boardwalk to the beach. This lovely home is located in the Seacrest community of Southern Shores and is a short drive from Duck and Kitty Hawk. Bedroom (with 2 Bunk sets, flat screen TV, DVD player) shares a bath (with shower) with den with Queen sleep sofa, card table, and flat screen TV. Laundry room with utility sink. Great room with cathedral ceilings, wet bar, and ocean view. Kitchen with breakfast bar, cooking island, double oven, dishwasher, microwave; dining area, powder room. 3 master bedrooms (1 with King, flat screen TV, bath with shower; 1 with Twins, flat screen TV, DVD player, bath with tub and shower; 1 with King, flat screen TV, lounge area, bath with double vanity, separate tub and shower).